Since the turn of the millennium, home health care agencies have had to collect and report data for the Outcome and Assessment Information Set (OASIS) as required by the Centers for Medicare & Medicaid Services (CMS). OASIS data must be collected for all adults who receive home health services certified under Medicare and Medicaid. This data includes numerous measures that are used for various quality and reimbursement purposes. In addition, an OASIS subset of measures contributes to Home Health Compare star ratings, which rank home health care agencies on quality for consumers to view. Along with other changes across the health care system, CMS also added the OASIS-C measures related to evidence-based care in 2010, increasing the amount of data agencies need to collect. CMS updates the OASIS measures in the prospective payment system (PPS) update periodically. To stay on top of which measures are added, changed or eliminated from the OASIS set, agencies need to read the PPS proposals and final rules as they come out. In the Home Health CY 2018 Final Rule, CMS made numerous OASIS changes that will go into effect January 1, 2019. 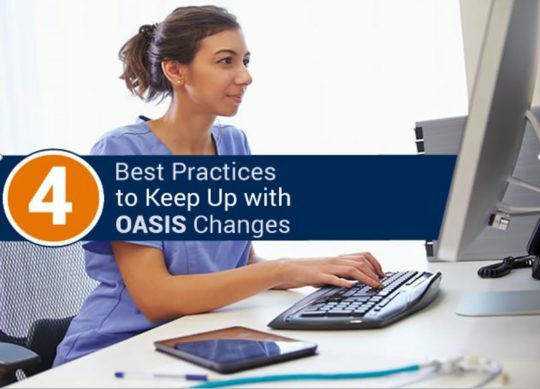 To ensure that OASIS coders are documenting accurately, they need to know the latest codes and measures by staying on top of updates and alerts from CMS annually. Turning to a technology vendor can also be a helpful resource. Brightree is committed to making regulatory and compliance changes or updates that are necessary within the product in a timely fashion. The biggest barriers of OASIS review is the clinical knowledge necessary and the cost of hiring experienced, OASIS-certified staff. Since there are two separate certifications, OASIS certification and coding certification, some home health care providers designate a staff member or certain members to either undertake OASIS training themselves or to be in charge of seeing that other workers become certified and can stay on top of the measures as they evolve. Other organizations contract with an outside vendor to facilitate their coding and OASIS reviews. Staff members should also be fully educated on standardized assessment tools, and the assessment protocols specific to their agency and the broader OASIS requirements. In addition, staffing consistency can also help, as the same clinicians that document assessment for start of care and discharge may provide more accurate documenting than multiple staff for the same case. Another tough issue in assessment answers and clinical documentation is inconsistency. OASIS documentation can vary widely from nurse to nurse for the very same patient, particularly if not all staff members are trained on some of the most basic OASIS conventions. Others might not fully understand the connection between assessing the patient, documenting OASIS measures related to the assessment and how those measures are tied to quality reporting. While there can be some instances of subjectivity when it comes to coding, it does not have to be an agency-wide issue that leads to mistakes and jeopardizes reimbursement. Ensure consistency by training within your organization if you have the resources to do so, or consult with an expert who can guide the person responsible for OASIS reporting within your organization. Spending time to review documentation and having a quality assurance process is another essential piece of the OASIS puzzle. Training can be helpful here, as organizations that lack the staff to conduct quality assurance reviews may have gaps in their process. Organizations should implement quality assurance processes, such as the soon to be required QAPI programs, for staff and supervisors. Promoting quality goals can also be a nudge for staff to keep to an assurance process, as well as implementing a process for auditing records. With high stakes and lots of specific outcome requirements, agencies that have their systems and processes in place will be better equipped to handle and thrive in their OASIS coding and documentation. By taking proactive steps towards identifying how technology fits into your business model, and partnering with the right system, an organization can reduce the effects of ongoing compliance and regulatory changes. This allows the focus on what matters most – providing exceptional patient care and ensuring a seamless experience for patients and their families. Brightree is a true point-of-care solution with built-in checks and balances that supports documentation compliance and also significantly reduces QA staff time. Seamlessly integrated with the back-office software, our customers have confidence that their patient records are complete and accurate and their overall employee satisfaction is improved. Brightree also has a team of OASIS review auditors with both clinical and regulatory knowledge in OASIS assessments. Our certified OASIS specialists examine the entire assessment document and OASIS questions along with the plan of care (POC). We also manage the time-consuming process of integrating ICD-10 coding into the OASIS review, allowing organizations to meet the collection and transmission requirements set forth by CMS, so your transmission is seamless. This content is provided for informational purposes only and is not intended to be, and should not be construed as, legal advice. Brightree strongly recommends each agency consult with counsel of its own choosing for legal advice on next steps in this matter that best suits it.